The Asian black bear (Ursus thibetanus, previously known as Selenarctos thibetanus), also known as the moon bear and the white-chested bear, is a medium-sized bear species native to Asia and largely adapted to arboreal life. It lives in the Himalayas, in the northern parts of the Indian subcontinent, Korea, northeastern China, the Russian Far East, the Honshū and Shikoku islands of Japan, and Taiwan. It is classified as vulnerable by the International Union for Conservation of Nature (IUCN), mostly because of deforestation and hunting for its body parts. The species is morphologically very similar to some prehistoric bears, and is thought by some scientists to be the ancestor of other extant bear species (aside from pandas and spectacled bears). Although largely herbivorous, Asian black bears can be very aggressive toward humans, who frequently trap or kill them for traditional medicine. Asiatic black bears are black and have a light brown muzzle. They are white on the chin, and have a distinct white patch on the chest, which sometimes has the shape of a V. Their ears are bell shaped, proportionately longer than those of other bears, and stick out sideways from the head. The tail is 11 cm (4.3 in) long. Adults measure 70–100 cm (28–39 in) at the shoulder, and 120–190 cm (47–75 in) in length. Adult males weigh 60–200 kg (130–440 lb) with an average weight of about 135 kg (298 lb). Adult females weigh 40–125 kg (88–276 lb), and large ones up to 140 kg (310 lb). Asiatic black bears are similar in general appearance to brown bears, but are more lightly built and are more slender limbed. The lips and nose are larger and more mobile than those of brown bears. The skulls of Asiatic black bears are relatively small, but massive, particularly in the lower jaw. Adult males have skulls measuring 311.7 to 328 mm (12.27 to 12.91 in) in length and 199.5–228 mm (7.85–8.98 in) in width, while female skulls are 291.6–315 mm (11.48–12.40 in) long and 163–173 mm (6.4–6.8 in) wide. Compared to other bears of the genus Ursus, the projections of the skull are weakly developed; the sagittal crest is low and short, even in old specimens, and does not exceed more than 19–20% of the total length of the skull, unlike in brown bears, which have sagittal crests comprising up to 41% of the skull's length. Although mostly herbivorous, the jaw structure of Asiatic black bears is not as specialized for plant eating as that of pandas: Asian black bears have much narrower zygomatic arches, and the weight ratio of the two pterygoid muscles is also much smaller in Asian black bears. The lateral slips of the temporal muscles are thicker and stronger in black bears. A black bear with broken hind legs can still climb effectively. In contrast to polar bears, Asiatic black bears have powerful upper bodies for climbing trees, and relatively weak hind legs which are shorter than those in brown bears and American black bears. They are the most bipedal of all bears, and have been known to walk upright for over a quarter mile. The heel pads on the forefeet are larger than those of most other bear species. Their claws, which are primarily used for climbing and digging, are slightly longer on the fore foot (30–45 mm) than the back (18–36 mm), and are larger and more hooked than those of the American black bear. On average, adult Asiatic black bears are slightly smaller than American black bears, though large males can exceed the size of several other bear species. The famed British sportsman known as the "Old Shekarry" wrote of how a black bear he shot in India probably weighed no less than 363 kg (800 lb) based on how many people it took to lift its body. The largest Asiatic black bear on record allegedly weighed 200 kg (440 lb). Zoo-kept specimens can weigh up to 225 kg (496 lb). Although their senses are more acute than those of brown bears, their eyesight is poor, and their hearing range is moderate, the upper limit being 30 kHz. Biologically and morphologically, Asiatic black bears represent the beginning of the arboreal specialisations attained by sloth bears and sun bears. Asiatic black bears have karyotypes nearly identical to those of the five other ursine bears, and, as is typical in the genus, they have 74 chromosomes. From an evolutionary perspective, Asiatic black bears are the least changed of Old World bears, with certain scientists arguing that it is likely that all other lineages of ursine bear stem from this species. Scientists have proposed that Asiatic black bears are either a surviving, albeit modified, form of Ursus etruscus, specifically the early, small variety of the Middle Villafranchian (Upper Pliocene to Lower Pleistocene) or a larger form of Ursus minimus, an extinct species that arose 4,000,000 years ago. With the exception of the age of the bones, it is often difficult to distinguish the remains of Ursus minimus with those of modern Asiatic black bears. Asiatic black bears are close relatives to American black bears, with which they share a European common ancestor; the two species are thought to have diverged 3,000,000 years ago, though genetic evidence is inconclusive. Both American and Asiatic species are considered sister taxa and are more closely related to each other than other species of bear. The earliest American black bear fossils, which were located in Port Kennedy, Pennsylvania, greatly resemble the Asiatic species. 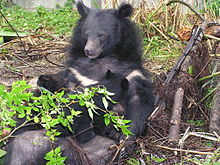 The first mtDNA study undertaken on Asiatic black bears suggested that the species arose after the American black bears, while a second study could not statistically resolve the branching order of sloth bears and the two black species, suggesting that these three species underwent a rapid radiation event. A third study suggested that American black bears and Asiatic black bears diverged as sister taxa after the sloth bear lineage and before the sun bear lineage. Further investigations on the entire mitochondrial cytochrome b sequence indicate that the divergence of continental and Japanese black bear populations might have occurred when bears crossed the land bridge between the Korean peninsula and Japan 500,000 years ago, which is consistent with paleontological evidence. Until the Late Pleistocene, two further subspecies ranged across Europe and western Asia. These are Ursus thibetanus mediterraneus in western Europe and the Caucasus and Ursus thibetanus permjak from eastern Europe, especially the Ural Mountains. Asiatic black bears are reproductively compatible with several other bear species, and have on occasion produced hybrid offspring. 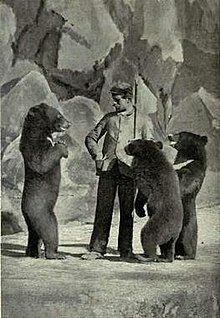 According to Jack Hanna's Monkeys on the Interstate, a bear captured in Sanford, Florida, was thought to have been the offspring of an escaped female Asiatic black bear and a male American black bear, and Scherren's Some notes on hybrid bears published in 1907 mentioned a successful mating between an Asiatic black bear and a sloth bear. In 1975, within Venezuela's "Las Delicias" Zoo, a female black bear shared its enclosure with a male spectacled bear, and produced several hybrid descendants. In 2005, a possible black bear–sun bear hybrid cub was captured in the Mekong River watershed of eastern Cambodia. An Asiatic black bear/brown bear hybrid, taken from a bile farm, is housed at the Animals Asia Foundation's China Moon Bear Rescue as of 2010[update]. Asiatic black bears are diurnal, though they become nocturnal near human habitations. They may live in family groups consisting of two adults and two successive litters of young. They will walk in a procession of largest to smallest. They are good climbers of rocks and trees, and will climb to feed, rest, sun, elude enemies and hibernate. Some older bears may become too heavy to climb. Half of their life is spent in trees and they are one of the largest arboreal mammals. In the Ussuri territory in the Russian Far East, black bears can spend up to 15% of their time in trees. Asiatic black bears break branches and twigs to place under themselves when feeding on trees, thus causing many trees in their home ranges to have nest-like structures on their tops. Asiatic black bears will rest for short periods in nests on trees standing fifteen feet or higher. Asiatic black bears do not hibernate over most of their range. They may hibernate in their colder, northern ranges, though some bears will simply move to lower elevations. Nearly all pregnant sows hibernate. Black bears prepare their dens for hibernation in mid-October, and will sleep from November until March. Their dens can either be dug out hollow trees (sixty feet above ground), caves or holes in the ground, hollow logs, or steep, mountainous and sunny slopes. They may also den in abandoned brown bear dens. Asiatic black bears tend to den at lower elevations and on less steep slopes than brown bears. Female black bears emerge from dens later than do males, and female black bears with cubs emerge later than barren females. Asiatic black bears tend to be less mobile than brown bears. With sufficient food, Asian black bears can remain in an area of roughly 1–2 sq km, and sometimes even as little as 0.5–1 sq km. Asiatic black bears have a wide range of vocalisations, including grunts, whines, roars, slurping sounds (sometimes made when feeding) and "an appalling row" when wounded, alarmed or angry. They emit loud hisses when issuing warnings or threats, and scream when fighting. When approaching other bears, they produce "tut tut" sounds, thought to be produced by bears snapping their tongue against the roof of their mouth. When courting, they emit clucking sounds. Within Sikhote-Alin, the breeding season of black bears occurs earlier than in brown bears, starting from mid June to mid August. Birth also occurs earlier, in mid January. By October, the uterine horns of pregnant females grow to 15–22 millimetres (0.59–0.87 in). By late December, the embryos weigh 75 grams. Sows generally have their first litter at the age of three years. Pregnant females generally make up 14% of populations. Similar to brown bears, Asiatic black bears have delayed implantation. Sows usually give birth in caves or hollow trees in winter or early spring after a gestation period of 200–240 days. Cubs weigh 13 ounces at birth, and will begin walking at four days of age, and open their eyes three days later. The skulls of newborn black bear cubs bear great resemblance to those of adult sun bears. Litters can consist of 1–4 cubs, with 2 being the average. Cubs have a slow growth rate, reaching only 2.5 kg by May. Black bear cubs will nurse for 104–130 weeks, and become independent at 24–36 months. There is usually a 2–3 year interval period before females produce subsequent litters. The average lifespan in the wild is 25 years, while the oldest Asian black bear in captivity died at the age of 44. Asiatic black bears are omnivorous, and will feed on insects, beetle larvae, invertebrates, termites, grubs, carrion, bees, eggs, garbage, mushrooms, grasses, fruits, nuts, seeds, honey, herbs, acorns, cherries, dogwood, and grain. Although herbivorous to a greater degree than brown bears, and more carnivorous than American black bears, Asiatic black bears are not as specialized in their diet as pandas are: while pandas depend on a constant supply of low calorie, yet abundant foodstuffs, black bears are more opportunistic and have opted for a nutritional boom-or-bust economy. They thus gorge themselves on a variety of seasonal high calorie foods, storing the excess calories as fat, and then hibernate during times of scarcity. Black bears will eat pine nuts and acorns of the previous year in the April–May period. In times of scarcity, they enter river valleys to gain access to hazelnuts and insect larvae in rotting logs. From mid-May through late June, they will supplement their diet with green vegetation and fruit. Through July to September, they will climb trees to eat bird cherries, pine cones, vines and grapes. On rare occasions they will eat dead fish during the spawning season, though this constitutes a much lesser portion of their diet than in brown bears. In the 1970s, black bears were reported to kill and eat Hanuman langurs in Nepal. They appear to be more carnivorous than most other bears, including American black bears, and will kill ungulates with some regularity, including domestic livestock. Wild ungulate prey can include muntjacs, serow, takin, wild boar and adult water buffaloes, which they kill by breaking their necks. Asiatic black bears may be occasionally attacked by tigers and brown bears, although leopards and packs of wolves and dholes can also be threats. Eurasian lynxes are a potential predator of cubs. Black bears usually dominate Amur leopards in physical confrontations in heavily vegetated areas, while leopards are uppermost in open areas, though the outcome of such encounters is largely dependent on the size of the individual animals. Leopards have been known to prey on cubs younger than two years old. The Asiatic black bear's range overlaps with that of sloth bears in central and southern India, sun bears in Southeast Asia and brown bears in the southern part of the Russian Far East. Ussuri brown bears may attack black bears, though Himalayan brown bears seem to be intimidated by the black species in direct encounters. They will eat the fruit dropped by black bears from trees, as they themselves are too large and cumbersome to climb. Tigers will occasionally prey on black bears. Russian hunters may occasionally find black bear carcasses showing evidence of tiger predation, and their remains may occur in tiger scats. If they manage to escape a tiger, black bears will attempt to rush up a tree and wait for the tiger to leave, though some tigers will pretend to leave, and wait for the bear to descend. One Manchurian tiger was reported to have lured an Asiatic black bear by imitating the species' mating call. Tigers regularly prey on young bears but adult bears are occasionally taken as well. Black bears are usually safe from tiger attacks once they reach five years of age. Although black bears prefer to avoid tigers, they can be extremely tenacious when attacked: Jim Corbett observed a fight between a tiger and the largest black bear he had ever seen, which resulted in the bear managing to chase off the tiger, despite having half its nose and scalp torn off. However, black bears may be less vulnerable than brown bears to tiger predation, due to their habit of living in hollows or in close set rocks, thus making them harder to pursue. At least one fatal attack on a juvenile bear has been recorded in Jigme Dorji National Park, as Bhutan's tiger populations have begun to colonise higher altitude areas. Black bears may steal tiger kills: Jim Corbett twice saw black bears carry off tiger kills when the latter was absent. Black bears typically inhabit deciduous forests, deserts, mixed forests and thornbrush forests. They rarely live in elevations of more than 12,000 feet (3,700 m). They usually inhabit elevations around 11,480 feet (3,500 m) in the Himalayas in the summer, and will climb down to 4,920 feet (1,500 m) in winter. They sometimes occur at sea level in Japan. The fossil record indicates that black bears once ranged as far west as Germany and France, though the species now occurs very patchily throughout its former range, which is now limited to the Asian continent. Black bears occupy a narrow band from southeastern Iran eastward through Afghanistan and Pakistan, across the foothills of the Himalayas in India, to Myanmar. With the exception of Malaysia, black bears occur in all countries in mainland Southeast Asia. They are absent from much of east-central China, though they have a patchy distribution in the southern and northeastern part of the country. Other population clusters exist in the southern Russian Far East and into North Korea. South Korea has a small remnant population. Black bears also occur in Japan's islands of Honshu and Shikoku and on Taiwan and Hainan. There is no definitive estimate as to the number of Asiatic black bears: Japan posed estimates of 8–14,000 bears living on Honshū, though the reliability of this is now doubted. Although their reliability is unclear, rangewide estimates of 5–6,000 bears have been presented by Russian biologists. In 2012, Japanese Ministry of the Environment estimated the population at 15–20,000. Rough density estimates without corroborating methodology or data have been made in India and Pakistan, resulting in the estimates of 7–9,000 in India and 1,000 in Pakistan. Unsubstantiated estimates from China give varying estimates between 15–46,000, with a government estimate of 28,000. Wildlife Trust of Bangladesh conducted an on field survey of bears in Bangladesh from 2008–2010 that included Asiatic black Bears. The survey was done in 87 different places mostly in north-central, north eastern and south eastern area of Bangladesh that had historical presence of bears. The survey result says that most of the areas still has some isolated small bear populations mainly the Asiatic black bears. According to the survey the most evidence found relating bears were of Asiatic black bears that included nests, footprints, local sighting etc. There are many reports on the presence of Asiatic black bears in central, north-central, north eastern and south eastern parts of Bangladesh. Although Asiatic black bears still occurs in different parts of the country mainly in the Chittagong Hill Tracts, the population is very low in number. The survey also fears that Asiatic black bears will soon be extinct from Bangladesh if necessary steps are not taken in near future. Three subspecies of Asiatic black bear occur in China: the Tibetan subspecies (U. thibetanus thibetanus), the Si Chuan subspecies (U. thibetanus mupinensis), and the northeastern subspecies (U. thibetanus ussuricus), which is the only subspecies of bear in northeastern China. Asiatic black bears are mainly distributed in the conifer forests in the cold and temperate zones of northeast China, the main areas being Chang Bai, Zhang Guangcai, Lao Ye, and the Lesser Xingan Mountains. Within Liaoning province, there are about 100 black bears, which only inhabit the five counties of Xin Bin, Huan Ren, Ben Xi, Kuan Dian, and Fen Cheng. Within Jilin province, black bears occur mainly in the counties of Hunchun, Dun Hua, Wangqing, An Tu, Chang Bai, Fu Song, Jiao He, Hua Dian, Pan Shi, and Shu Lan. In Heilongjiang province, Asiatic black bears occur in the counties of Ning An, BaYan, Wu Chang, Tong He, Bao Qing, Fu Yuan, Yi Chun, Tao Shan, Lan Xi, Tie Li, Sun Wu, Ai Hui, De Du, Bei An, and Nen Jiang. This population has a northern boundary of about 50° N and the southern boundary in Feng Cheng is about 40°30" N.
In Russia, the black bear's northern range runs from Innokenti Bay on the coast of the Sea of Japan southwest to the elevated areas of Sikhote Alin crossing it at the sources of the Samarga River. At this point, the boundary directs itself to the north, through the middle course of the Khor, Anyui and Khungari rivers, and comes to the shore of the Amur, crossing the it at the level of the mouth of the Gorin. Along the Amur river, the species' presence has been noted as far as 51° N. Lat. From there, the territorial boundary runs southwest of the river's left bank, passing through the northern part of Lake Bolon and the juncture point of the Kur and Tunguska. Black bears are encountered in the Urmi's lower course. Within the Ussuri krai, the species is restricted to broad leaved Manchurian type forests. The Asiatic black bear is listed as a protected animal in China's National Protection Wildlife Law, which stipulates that anyone hunting or catching bears without permits will be subject to severe punishment. Although the black bear is protected in India, due to being listed as vulnerable in the Red Data Book in Appendix I of CITES in India and in Schedule I of the Indian Wildlife (Protection) Act and its 1991 amendment, it has been difficult to prosecute those accused of poaching black bears due to lack of witnesses and lack of Wildlife Forensic Labs to detect the originality of confiscated animal parts or products. Moreover, due to India's wide stretching boundaries with other nations such as Pakistan, Tibet, China, Nepal, Bhutan, Bangladesh and Myanmar, it is difficult to police such borders, which are often in mountainous terrain. Five black bear populations, occurring in Kyushu, Shikoku, West-Chugoku, East-Chugoku and Kii areas, were listed as endangered by the Environmental Agency in the Japanese Red Data Book in 1991. Small isolated populations in the Tanzawa and Shimokita areas of mainland Honshū were listed as endangered in 1995. Beyond recognising these populations as endangered, there is still a lack of efficient conservation methods for Japanese black bears. Black bears occur as an infrequent species in the Red Data Book of Russia, thus falling under special protection and hunting is prohibited. There is currently a strong movement to legalize the hunting of Russian black bears, which is supported by most of the local scientific community. As of January 30, 1989, Taiwan's Formosan black bears have been listed as an endangered species under the Natural and Cultural Heritage Act on, and was later listed as a Conserved Species Category I. The Vietnamese Government issued Decision 276/QD, 276/1989, which prohibits the hunting and exporting of black bears. The Red Book of Vietnam lists Vietnamese black bears as endangered. The Korean Government designated the Asian black bear as a Natural Monument No.329 and it is considered as extinction crisis. At present time Endangered Species Restoration Center of Korea National Park Service is going through species restoration business. 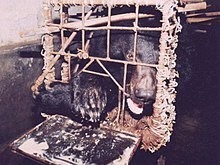 A bile bear in a "crush cage" on Huizhou Farm, China. The main habitat threat to Chinese black bears is overcutting of forests, largely due to human populations increasing to over 430,000 in regions where bears are distributed, in the Shaanxi, Ganshu, and Sichuan provinces. 27 forestry enterprises were built in these areas between 1950 and 1985 (excluding the lumbering units belonging to the county). By the early 1990s, the black bear distribution area was reduced to only one-fifth of the area that existed before the 1940s. Isolated bear populations face environmental and genetic stress in these circumstances. However, one of the most important reasons for their decrease involves overhunting, as black bear paws, gall bladders and cubs have great economic value. Black bear harvests are maintained at a high level due to the harm they cause to crops, orchards and bee farms. During the 1950s and 1960s, 1000 bears were harvested annually in the Heilongjiang Province. However, purchased furs were reduced by 4/5, even by 9/10 yearly in the late 1970s to the early 1980s. Bears have also been declining annually in Dehong Dai and Jingpo Nations Autonomous Prefecture and the Yunnan Province. Poaching for gall bladders and skin are the main threat faced by black bears in India. In Pakistan it is listed as an endangered species. Although the poaching of bears is well known throughout Japan, authorities have done little to remedy the situation. The killing of nuisance bears is practiced year-round, and harvest numbers have been on the increase. Box traps have been widely used since 1970 to capture nuisance bears. It is estimated that the number of shot bears will decrease in time, due to the decline of old traditional hunters and the increase of a younger generation less inclined to hunt. Logging is also considered a threat. Although black bears have been afforded protection in Russia since 1983, illegal poaching, fuelled by a growing demand for bear parts in the Asian market, is still a major threat to the Russian population. Many workers of Chinese and Korean origin, supposedly employed in the timber industry, are actually involved in the illegal trade. Some Russian sailors reportedly purchase bear parts from local hunters to sell them to Japanese and Southeast Asian clients. Russia's rapidly growing timber industry has been a serious threat to the Asiatic black bear's home range for three decades. The cutting of trees containing cavities deprives black bears of their main source of dens, and forces them to den on the ground or in rocks, thus making them more vulnerable to tigers, brown bears and hunters. In Taiwan, black bears are not actively pursued, though steel traps set out for wild boars have been responsible for unintentional bear trappings. Timber harvesting has largely stopped being a major threat to Taiwan's black bear population, though a new policy concerning the transfer of ownership of hill land from the government to private interests has the potential to affect some lowland habitat, particularly in the eastern part of the nation. The building of new cross island highways through bear habitat is also potentially threatening. Vietnamese black bear populations have declined rapidly due to the pressures of human population growth and unstable settlement. Vietnamese forests have been: of the 87,000km2 of natural forests, about 1,000km2 disappear every year. Hunting pressures have also increased with a coinciding decline of environmental awareness. South Korea remains one of two countries to allow bear bile farming to continue legally. As reported in 2009, approximately 1,374 bears reside in an estimated 74 bear farms where they are kept for slaughter to fuel the demands of traditional Asian medicine. In sharp contrast, fewer than 20 bears can be found at Jirisan Restoration Center, located in Korea's Jirisan National Park. In Japanese culture, the black bear is traditionally associated with the mountain spirit (yama no kami) and is characterized variously as "mountain man" (yamaotoko), "mountain uncle" (yama no ossan), "mountain father" (yama no oyaji), a loving mother and a child. Being a largely solitary creature, the bear is also viewed as "lonely person" (sabishigariya). Black bears feature very little in lowland Japanese folklore, but are prominent in upland Japan, a fact thought to reflect the bear's greater economic value in upland areas. According to the local folklore in Kituarahara-gun in Niigata, the black bear received its white mark after being given a silk-wrapped amulet by yama no kami, which left the mark after being removed. In Hindu mythology, the black bear Jambavantha (also known as Jambavan or Jamvanta) is believed to have lived from Treta Yuga to Dvapara Yuga. In the epic Ramayana, Jambavantha assists Rama in finding his wife Sita and battle her abductor, Ravana. 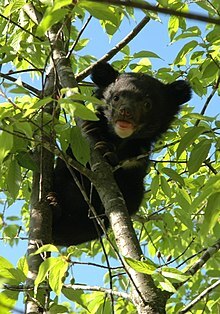 Asiatic black bears are briefly mentioned in Yann Martel's novel The Life of Pi, in which they are described by the protagonist's father as being among the most dangerous animals in his zoo. The Himalayan black bear is a savage animal, sometimes attacking without provocation, and inflicting horrible wounds, attacking generally the head and face with their claws, while using their teeth also on a prostrate victim. It is not uncommon to see men who have been terribly mutilated, some having the scalp torn from the head, and many sportsmen have been killed by these bears. 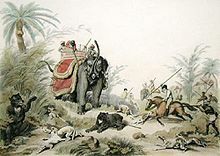 Mr Sterndale, in the course of his interesting papers on the Mammalia of British India, remarks of Ursus Tibetanus, commonly known as the Himalayan Black Bear, that 'a wounded one will sometimes show fight, but in general it tries to escape.' This description is not, I think, quite correct. As it would lead one to suppose that this bear is not more savage than any other wild animal—the nature of most of the feræ being to try to escape when wounded, unless they see the hunter who has fired at them, when many will charge at once, and desperately. The Himalayan Black Bear will not only do this almost invariably, but often attacks men without any provocation whatever, and is altogether about the most fierce, vicious, dangerous brute to be met with either in the hills or plains of India. [...] These brutes are totally different in their dispositions to the Brown Bear (Ursus Isabellinus), which, however desperately wounded, will never charge. I believe there is no case on record of a hunter being charged by a Brown Bear; or even of natives, under any circumstances, being attacked by one; whereas every one of your readers who has ever marched in the Himalayas must have come across many victims of the ferocity of Ursus Tibetanus. At the turn of the 20th century, a hospital in Srinagar, Kashmir received dozens of black bear victims annually. When black bears attack humans, they rear up on their hind legs and knock victims over with their paws. Then they bite them on an arm or leg and snap on the victim's head, this being the most dangerous part of the attack. Bear attacks have been increasing in Kashmir since the Kashmir conflict. In November 2009, in the Kulgam district of Indian-administered Kashmir, a black bear attacked four insurgents after discovering them in its den, and killed two of them. In India, attacks on humans have been increasing yearly, and have occurred largely in the northwestern and western Himalayan region. In the Chamba District of Himachal Pradesh, the number of black bear attacks on humans have gradually increased from 10 in 1988–89 to 21 in 1991–92. There are no records of predation on humans by Asian black bears in Russia and no conflicts have been documented in Taiwan. Recent bear attacks on humans have been reported from Junbesi in Langtang National Park, Nepal, and occurred in villages as well as in the surrounding forest. Li Guoxing, the second person in history to have received a facial transplant, was a victim of a black bear attack. Nine people were killed by black bears in Japan between 1979–1989. In September 2009, a black bear attacked a group of tourists, mauling nine people and seriously injuring four at a bus station in the built-up area of Takayama, Gifu. The majority of attacks tend to occur when black bears are encountered suddenly, and in close quarters. Because of this, black bears are generally considered more dangerous than brown bears, which live in more open spaces and are thus less likely to be surprised by approaching humans. They are also likely to attack when protecting food. On May 7, 2013 in India, a group of bears attacked villages in Orissa, killing eight and injuring "a dozen more". The bears are said to have adopted such aggressive behavior due to excessive consumption of the mahua flower. 2016 saw several attacks by black bears in Japan. In May and June four people were killed by bears in Akita prefecture while picking bamboo shoots, and in August a female safari park worker in Gunma prefecture was killed when a black bear climbed into her car and attacked her. In September a 63-year old fisherman who was also a black belt in karate managed to fight off a black bear attack by destroying its right eye. In the past, the farmers of the Himalayan lowlands feared black bears more than any other pest, and would erect platforms in the fields, where watchmen would be posted at night and would beat drums to frighten off any interlopers. However, some black bears would grow accustomed to the sound and encroach anyway. Of 1,375 livestock kills examined in Bhutan, black bears accounted for 8% of attacks. Livestock predation, overall, was greatest in the summer and autumn periods, which corresponded with a peak in cropping agriculture; livestock are turned out to pasture and forest during the cropping season and, subsequently, are less well guarded than at other times. Livestock killed by black bears in Himachal Pradesh, India increased from 29 in 1988–1989 to 45 in 1992–1993. In the remoter areas of Japan, black bears can be serious crop predators: black bears feed on cultivated bamboo shoots in spring, on plums, watermelons and corn in the summer, and on persimmons, sweet potatoes and rice in the autumn. Japanese black bears are estimated to damage 3,000 bee hives annually. When feeding on large crops such as watermelons or pumpkins, black bears will ignore the flesh, and eat the seeds, thus adversely affecting future harvests. Black bears can girdle and kill trees by stripping their bark for the sap. This can cause serious economic problems in Asia's valuable timber forests. In the late 1970s, 400-1,200 hectares of land had been affected by bears bark stripping Japanese conifers. There is evidence that 70-year-old conifers (commanding the highest market values) may also have been bark stripped. Black bears will prey on livestock if their natural food is in poor supply. They have been known to attack bullocks, either killing them outright, or eating them alive. Black bears are easily tamed, and can be fed with rice, maize, sweet potato, cassava, pumpkin, ripe fruit, animal fat and sweet foods. Keeping captive black bears is popular in China, especially due to the belief that milking the bear's gall bladder leads to quick prosperity. Bears are also popular as pets in Vietnam. Black bear stalking in the forests bordering the valley of Kashmir requires much more care than is expended in approaching brown bear on the open hills above, the senses of sight and hearing being more strongly developed in the black than in the brown species. Many of these forests are very dense, so that it requires the eye of a practised shikari to detect the dark forms of the bears while searching for chestnuts on the ground without the advancing party being detected by the vigilant animals. The book also describes a second method of black bear hunting involving the beating of small patches of forest, when the bears march out in single file. However, black bears were rarely hunted for sport, because of the poor quality of their fur and the ease by which they could be shot in trees, or stalked, as their hearing was poor. Black bears here afford no sport; it is not shooting at all, it is merely potting a black thing in a tree... I can assure the reader that if he has a fondness for stalking, he will despise bear-killing, and will never shoot at them if there is a chance of anything else. If a man were to hunt for nothing else but bears, and kill a hundred in his six months' leave, he would not have enjoyed such real sport as he would, had he killed ten buck ibex or markhoor. Although easy to track and shoot, black bears were known by British sportsmen to be extremely dangerous when injured. Brigadier General R.G. Burton wrote of how many sportsmen had been killed by black bears after failing to make direct hits. Today, black bears are only legally hunted for sport in Japan and Russia. In Russia, 75–100 black bears are legally harvested annually, though 500 a year are reportedly harvested illegally. Russian sport hunting of black bears became legalised in 2004. According to a 2008 article written in The Sun, Russia's Slavic Hunting Club offers four day trips with four guaranteed black bear kills for the sum of £16,000. The article indicated that clients receiving permits for black bear hunts included people from Britain, the United States, Germany, Spain, Poland and Finland. 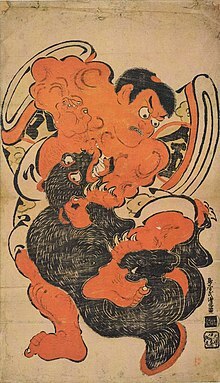 After the introduction of Buddhism in Japan, which prohibited the killing of animals, the Japanese compromised by devising different strategies in hunting bears. Some, such as the inhabitants of the Kiso area in the Nagano Prefecture, prohibited the practise altogether, while others developed rituals in order to placate the spirits of killed bears. In some Japanese hunting communities, black bears lacking the white chest mark are considered sacred. In the Akita Prefecture, bears lacking the mark were known by matagi huntsmen as minaguro (all black) or munaguro (black chested), and were also considered messengers of yama no kami. If such a bear was shot, the huntsman would offer it to yama no kami, and give up hunting from that time on. Similar beliefs were held in Nagano, where the completely black bears were termed nekoguma or cat-bear. Matagi communities believed that killing a bear in the mountains would result in a bad storm, which was linked to the belief that bear spirits could affect weather. The matagi would generally hunt bears in spring or from late autumn to early winter, before they hibernated. In mountain regions, bears were hunted by driving them upland to a waiting hunter who would shoot it. Bear hunting expeditions were preceded by rituals, and could last up to two weeks. After killing the bear, the matagi would pray for the bear's soul. Bear hunts in Japan are often termed kuma taiji, meaning "bear conquest". The word taiji itself is often used in Japanese folklore to describe the slaying of monsters and demons. Traditionally, the Atayal, Taroko, and Bunun tribes of Taiwan consider black bears to be almost human in their behaviours, and thus unjust killing of bears is equated with murder and will cause misfortunes such as disease, death, or crop failure. The Bunun people call black bears Aguman or Duman which means devil. Traditionally, a Bunun hunter who has accidentally trapped a bear has to build a cottage in the mountains and cremate the bear within it. The hunter must stay in the cottage alone, away from the village until the end of the millet harvest, as it is believed that the killing of a black bear will cause the millet crop to burn black. In the Tungpu area, black bears are considered animals of the "third category": animals with the most remote relationship to humans and whose activity is restricted outside human settlements. Therefore, when black bears encroach upon human settlements, they are considered ill omens. In this situation, the community can either destroy trespassing bears or settle somewhere else. The Rukai and Paiwan people are permitted to hunt black bears, though they believe that doing so will curse the hunters involved: Rukai people believe that hunting bears can result in disease. Children are forbidden from eating bear meat, which is itself not permitted to be taken within homes. 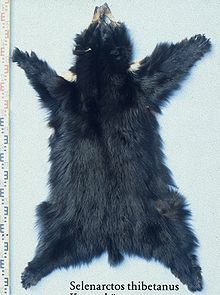 Accounts on the quality of the black bear's fur vary. According to Natural History of the Mammalia of India and Ceylon, "Their skins are always poor and mangy, and generally so greasy that they are very difficult to keep until you can make them over to the dresser", which is corroborated by The great and small game of India, Burma, and Tibet, which states "... the skins are never of any particular value, and in autumn, owing to the masses of yellow fat that are accumulated beneath them, are absolutely useless." The first part of volume II of Mammals of the Soviet Union on the other hand states that Asian black bears yield fur, meat and fat of greater quality than those of brown bears. In British India, grease was the only practical use for black bear carcasses. Bears living near villages were considered the most ideal, as they were almost invariably fatter than their forest dwelling counterparts. Asiatic black bears have been hunted for their parts in China since the Stone Age. Bile is most appreciated as it supposedly cures many diseases, effectively treats the accumulation of blood below the skin, and counters toxic effects. Also, bear bone glue is used as a tonic, and bear fat is also used as a traditional medicine and a tonic. Black bear meat is also edible. Due to their many uses black bears are worth about 20–30 million dong (US$1,500–2,250) each in Vietnam. ^ a b c d Montgomery, S. (2002). Search for the golden moon bear: science and adventure in Southeast Asia. Simon & Schuster. ISBN 978-0-7432-0584-9. ^ a b c d e f g h i j k l m n o Heptner, V. G. & Naumov, N. P. (1998). White-chested, black bear. Pages 713–733 in: Mammals of the Soviet Union Vol. II Part 1a, Sirenia and Carnivora (Sea cows; Wolves and Bears). Washington, D.C. : Smithsonian Institution Libraries and National Science Foundation. ^ Stirling, I., ed. (1993). Bears, Majestic Creatures of the Wild. Emmaus: Rodale Press. ^ Endo, H., Taru, H., Yamamoto, M., Arishima, K., & Sasaki, M. (2003). Comparative morphology of the muscles of mastication in the giant panda and the Asiatic black bear. Annals of Anatomy. Anatomischer Anzeiger 185 (3): 287–292. ^ a b Asiatic Black Bear ''Ursus thibetanus'', Denver Zoo Archived 2016-03-04 at the Wayback Machine. (PDF). Retrieved on 2011-09-26. ^ a b c Knight, C. (2008). The Moon Bear as a symbol of Yama: Its significance in the folklore and upland hunting in Japan.. Asian Ethnology 67 (1): 79–101. ^ Greenwood, J. (1862). Wild sports of the world: a boy's book of natural history and adventure. London: S.O. Beeton. ^ Bear Species @ Great Bear Foundation. Greatbear.org. Retrieved on 2011-09-26. ^ a b c d Lydekker, Richard (1900). The great and small game of India, Burma, and Tibet. Asian Educational Services. pp. 361–. ISBN 978-81-206-1162-7. ^ a b "Detailed Physiology Notes" with literature reports for the Asiatic black bear – Ursus thibetanus Archived 2011-09-30 at the Wayback Machine. Wildlife1.wildlifeinformation.org. Retrieved on 2011-09-26. ^ a b c d e f g h i j k l m n o p q r s t u v w x Servheen, C., Herrero, S., & Peyton, B. (1999). Bears: Status Survey and Conservation Action Plan. IUCN, Gland. ^ a b Herrero, S. (1972). Aspects of evolution and adaptation in American black bears (Ursus americanus Pallas) and brown and grizzly bears (U. arctos Linne.) of North America. Bears: Their biology and management: 221–231. ^ a b Macdonald, D. (1984). The Encyclopedia of Mammals: 1. London: Allen & Unwin. p. 446. ISBN 0-04-500028-X. ^ a b c d e f Pocock, R. I. (1941). The Fauna of British India, including Ceylon and Burma. Mammalia. Volume 2. Taylor and Francis, London. ^ Bears Of The World. "Himalayan Black Bear". Bears Of The World. Archived from the original on 20 March 2015. Retrieved 20 March 2015. ^ Baryshnikow, G. F. (2010). Middle Pleistocene Ursus thibetanus (Mammalia, Carnivora) from Kudaro Caves in the Caucasus. Proceedings of the Zoological Institute RAS, Vol. 314, No. 1, pp. 67–79. ^ Hybrid Bears. Messybeast.com. Retrieved on 2011-09-26. ^ Hybrid Asiatic black bear/brown bear ("Emma"). Animalsasia.org. Retrieved on 2011-09-26. ^ a b Seryodkin, I. V.; Goodrich, J. M.; et al. (2003). "Denning ecology of brown bears and Asiatic black bears in the Russian Far East" (PDF). Ursus. 14 (2): 153–161. JSTOR 3873015. ^ Schaller, G. B., Qitao, T., Johnson, K. G., Xiaoming, W., Heming, S., & Jinchu, H. (1989).The Feeding Ecology of Giant Pandas and Asiatic Black Bears in the Tangjiahe Reserve, China. In: Gittleman, J. L. (ed.) Carnivore Behavior, Ecology, and Evolution. Springer US. Pp. 212–241. ^ Neas, J. F. & R. S. Hoffmann (1987). "Burdocas taxicolor" (PDF). Mammalian Species. 277 (277): 1–7. doi:10.2307/3503907. JSTOR 3503907. ^ Hwang, M. H. (2003). Ecology of the Asiatic black bear and people-bear interactions in Yushan National Park, Taiwan. Ph.D. thesis, University of Minnesota. ^ a b c The IUCN Red List of Threatened Species, ''Ursus thibetanus'' Asiatic black bear, Vulnerable Archived 2012-03-23 at the Wayback Machine. (PDF). Retrieved on 2011-09-26. ^ a b Prynn, David (2004). Amur tiger. Russian Nature Press. p. 115. ^ a b c Himalayan bear killed by tiger: Is it effect of climate change on habitat?. Kuenselonline.com (2009-11-11). Retrieved on 2011-09-26. ^ "Baseline Survey Report of Bears in Bangladesh. 2008–2010" (PDF). ^ a b Xu, Xueliang (1997). "Historical and Present Status of the Asiatic Black Bear in Northeast China" (PDF). Int. Conf. Bear Res. And Manage. 9 (2): 53–55. doi:10.2307/3872661. JSTOR 3872661. Archived (PDF) from the original on 2010-12-03. ^ Asian Animal Protection Network Archived July 22, 2012, at the Wayback Machine. Aapn.org. Retrieved on 2011-09-26. ^ a b c d e Knight, John (2000). Natural Enemies: People-Wildlife conflicts in Anthropological Perspective. London: Routledge. p. 254. ISBN 0-415-22441-1. ^ ENVIS Centre on Conservation of Ecological Heritage and Sacred Sites of India. Ecoheritage.cpreec.org. Retrieved on 2011-09-26. ^ a b Sterndale, R. A. (1884). Natural History of the Mammalia of India and Ceylon. Thacker, Spink and Co, Calcutta. ^ Cornish, C. J., Selous, F. C., Johnston, H. H., Maxwell, H., (eds.) (1902). The living animals of the world; a popular natural history with one thousand illustrations. Volume 1: Mammals. Dodd, Mead and Company, New York. ^ Hussain, Altaf (2009-11-03). "Bear kills militants in Kashmir". BBC News. Retrieved 2010-04-25. ^ "China's first human face transplant successful". 2006-04-15. Archived from the original on 2007-10-13. Retrieved 2007-11-25. ^ "'First face transplant' for China". BBC News. 2006-04-14. Retrieved 2018-04-16. ^ "Bear mauls nine at Takayama bus terminal". Japan Times. 2009-09-20. Retrieved 2018-04-16. ^ "Bear attacks tourists in Japan". BBC News. 2009-09-19. Retrieved 2018-04-16. ^ a b c Burton, R. G. (1931). A Book of Man Eaters. Hutchinson & Co. Ltd., London. ^ "India panic after bears kill eight in Orissa state". BBC News. 2013-05-07. Retrieved 2018-04-16. ^ McCurry, Justin (2016-06-13). "Warning after four people killed in bear attacks in Japan". The Guardian. Guardian Media Group. Retrieved 2018-04-16. ^ "Japan safari park worker killed in bear attack". The Guardian. Guardian Media Group. Agence France-Presse. 2016-08-16. Retrieved 2018-04-16. ^ "Gunma bear driven away by karate punches after picking fight with wrong person". Japan Times. 2016-09-02. Retrieved 2018-04-16. 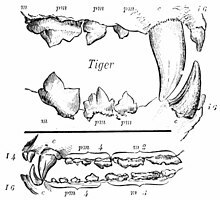 ^ Sangay, Tiger; Vernes, Karl (2008). "Human-wildlife conflict in the Kingdom of Bhutan: Patterns of livestock predation by large mammalian carnivores". Biological Conservation. 141 (5): 1272. doi:10.1016/j.biocon.2008.02.027. ^ ''Human casualties and livestock depredation by black and brown bears in the Indian Himalaya, 1989–98'', N.P.S. Chauhan, Wildlife Institute of India, P.O. Box 18, Chandrabani, Dehradun 248001, India. (PDF) . Retrieved on 2011-09-26. ^ a b c Brinckman, Arthur (1862). The rifle in Cashmere: a narrative of shooting expeditions in Ladak, Cashmere, Punjaub, etc., with advice on travelling, shooting, and stalking : to which are added notes on army reform and Indian politics. Smith, Elder. pp. 155–. ^ Super-rich kill bears for 'sport'. Thesun.co.uk (2008-02-05). Retrieved on 2011-09-26. Brown, Gary (1993). The Great Bear Almanac. Lyons & Burford. ISBN 978-1-55821-210-7.